I ask for a center cut of salmon. The butcher smiles, picks a beautiful pink rectangle, and places it on the scale. It is three-fourths of a pound, the exact weight I want. The scale tips to my favor. I had come straight from the lab, where my blood had been drawn to test for different types of arthritis and Lyme disease. The nurse was funny and we had a few laughs but the gloomy part of my mission remained: I needed to find out if there was an underlining cause for the tendinitis that had spread through my body, a reason it hadn’t fully healed after 3 years. None of the probable answers were great but it would be something at least, a way to clothe the suffering in medical language, a quick shorthand to use when someone asked about it. At home, I cut the salmon fillet in half lengthwise and admired the skin side, how the white scales merged into the black. The skin shimmers and it is easy to imagine the original body flashing through the water, magnificent, glinting, gloriously alive. I soaked the fillets in sake and salt, patted them dry and then sprinkled salt over the flesh. They rest now in the cool dark refrigerator and soon I will take them out, rinse them off, and broil them under a flame. 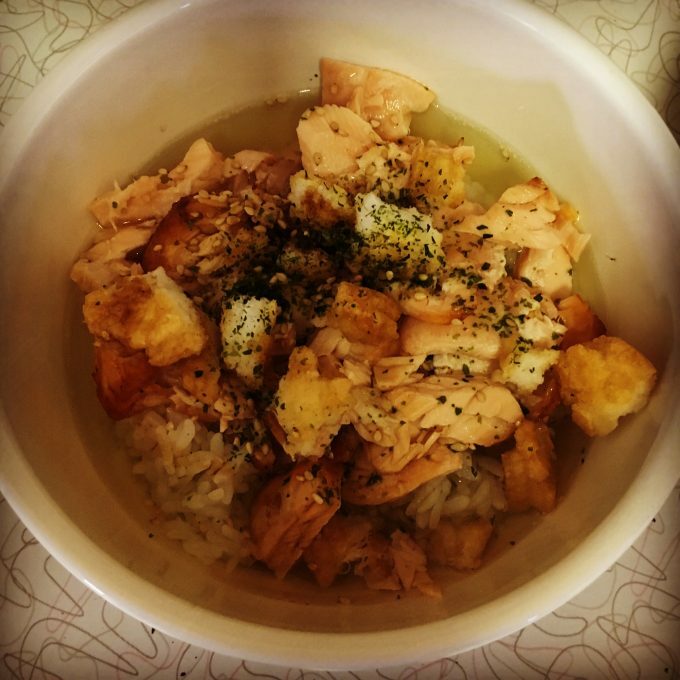 Salted salmon is not hard to make and it goes well with rice and green tea poured over the top. During these preparations, my left elbow aches and moans. The nurse had asked me to make a fist as she looked for a vein to draw blood and I had held the fist a few minutes long, unsure of when to let go. That short lived clenched fist aggravated the tendinitis in my left elbow. It swelled as I drove away from the lab and aches constantly now. I held a book in my left hand after I got home and instantly regretted the action. Everything has a price, even this simple recipe, even reading. My elbow burns and flares, hot and sore to the touch. Medication has never worked. I prepare salmon slowly and listen to the elbow’s pain as if it is a dead radio channel turned on in the background. “It could be fibromyalgia,” the doctor said, popping his head back in after he had already left. “I forgot to mention there’s a good chance of that.” He nodded, then left.